Crown molding is a decorative trim piece the sits on an angle, and is used to cover transitions between surfaces for decoration. It is installed where the walls and the ceilings meet, but it can also be used to fill the gap between the top of a bookcase or cabinet and the ceiling. They can either be plain or sprung. 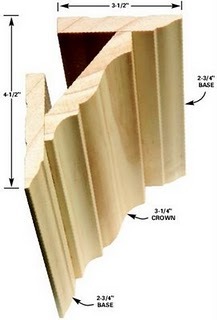 Crown is typically made from solid milled wood or plaster but may be made from plastic or reformed wood. Installing crown molding to a room instantly adds an aesthetically pleasing and classy look. Installing crown molding, is one of most important architectural elements used to define interior spaces. Most of today’s interior designers agree that every room benefits from the use of crown molding treatment. The installation of molding smooths the transition from wall to ceiling or bookcase to ceiling and defines the architectural style of a room. The size and style of crown molding used may vary widely, from a simple coves in a farmhouse kitchen to large built-up cornice in a grand entryways. The size and style of molding used may vary widely, from a simple coves in a farmhouse kitchen to open top crown with rope lighting to large built-up cornice in a grand entryways.